Cofounders Bill and Allison Spindler envisioned a DJ service that would fill venues with explosive energy. They established Double Platinum DJ as a modern wedding entertainment and event production service - to apply a sophisticated, stylish, and innovative approach to weddings and events. 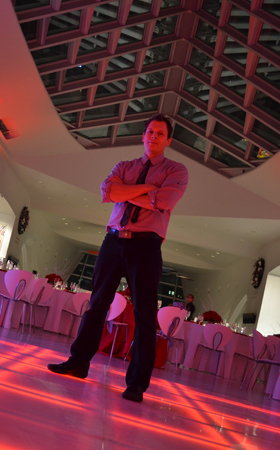 DPDJ is a fully customizable service that will personalize your event to make your vision come alive. We maintain an arsenal of Milwaukee's most talented DJs; your DJ will be selected based on your musical tastes and preferences. Their ability to adapt to their crowds in real time is sure to provide a level of engagement your guests have never experienced. They are the principal consideration behind Double Platinum winning the "Best Music – Weddings" category in the WISN A-List awards seven years running, as well as Modern Bride magazine's top recommended entertainment service in Wisconsin. Our wedding DJ and lighting package is all-inclusive. Light–up dance floors, music videos, and unique truss constructions can provide electrifying visual elements for a modern dance party or wedding environment. Moreover, custom monogram light projections, Chiavari chairs and up-lit crystal backdrops can satisfy the events that compel elegance. Most importantly, Double Platinum revels in our ability to produce an unforgettable experience for events with more subtle tastes – our core competency is our adaptability. Double Platinum is now also proud to offer event production services including sound engineering, audio/visual, stage lighting, and special effects.